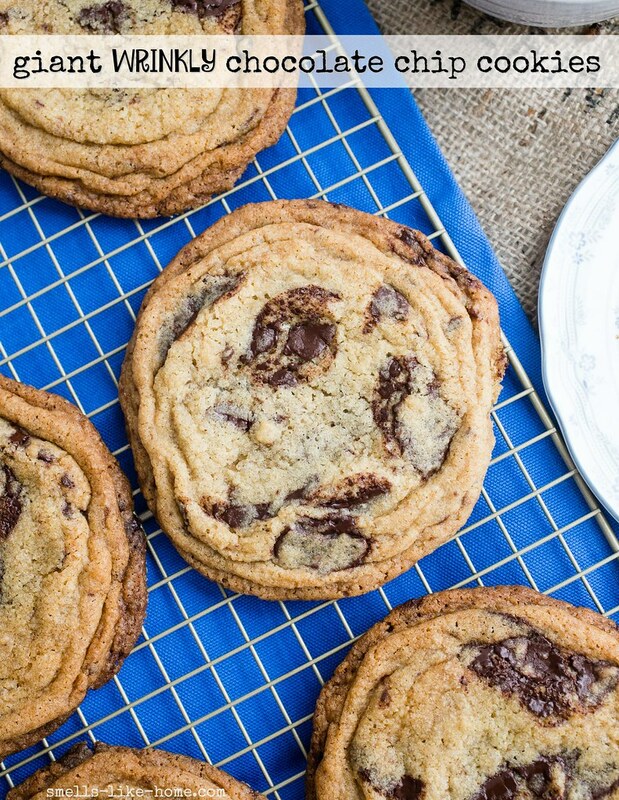 These giant wrinkly chocolate chip cookies give you extra crispy exteriors and extra chewy, gooey centers. Best of both cookie worlds! Don’t they remind you of wrinkly puppies? How could you not completely love those little guys?! Jackson is an adorable puppy (mommy pride) but these little ones just make me swoon! Anyway. These cookies. 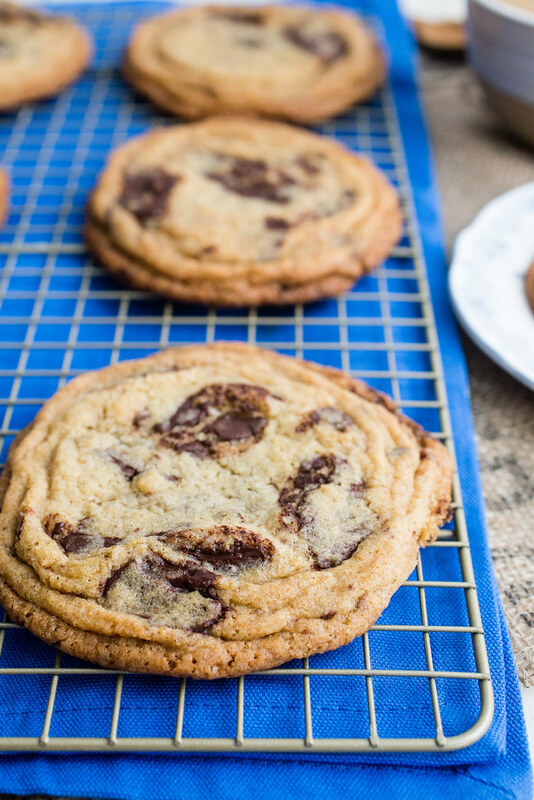 Aptly named giant wrinkly chocolate chip cookies. They’re pretty special. The wrinkles take a little extra work to create – including dropping a cookie sheet full of baking dough on the counter, which I found to be extremely cathartic – but they’re definitely worth it. The wrinkles create some extra surface area across the top of the cookies, giving them a little more of a crispy crunch factor to complement the chewy, slightly underbaked, gooey interiors. I liken them a lot to the giant cookies the lunch ladies would sell in my middle and high school cafeterias. Those of us cookie addicts would bum rush the line just to nab the hot almost-raw-centered cookies we begged for them to make for us. I’m SURE this was a big health code violation (hi! public health degree holder here ova hea!) but we certainly didn’t care. And I’m also sure they didn’t care either since those cookies sold out every single day. So back to these cookies. You MUST make them. They’re just another one of the whole bunch of stellar recipes I’ve made from Sarah Kieffer’s new-ish book. I’ve made Sarah’s banana bread recipe twice already and can’t keep in the house long enough to take photos of. These cookies were almost as much of a challenge in that area. Except that I threatened Kyle with drinking the rest of the milk before he could pour himself a glass to have with these cookies. Ah, marriage. While these cookies contain all of the usual cookie suspects (AP flour, white and brown sugars, eggs, butter, vanilla, etc. ), I easily and successfully swapped out half of the AP flour for white whole wheat flour and all of the granulated sugar for coconut sugar. This resulted in a slightly nutty flavor from the new flour – not at all overpowering – and half as much processed sugar. We both loved these changes but if you’re more into the traditional ingredients, the swaps I made were for equal amounts of flour and sugar to their substitutions as written below. Preheat oven to 350° F with an oven rack in the center position. Line two large baking sheets with aluminum foil, dull side up. In a small bowl, whisk the flours, baking soda, and salt together; set aside. In the bowl of a stand mixer fitted with the paddle attachment, beat the butter at medium speed until creamy, about 3 minutes. Add the sugars and continue to beat for another 2-3 minutes, until light and fluffy. Add the egg, vanilla, and water and mix on low until the egg is well-combined. Pour the flour into the bowl and stir on low until almost combined. Stir in the chocolate, mixing on low, just until the chocolate is incorporated and no traces of flour remain. Using a large cookie/ice cream scoop, shape the dough into 3 ½ oz (100 g) balls and place 4 of them on a baking sheet; freeze for 15 minutes before baking. When you take the first sheet out of the freezer to bake, but the second sheet of 4 in; repeat with the remaining 2 cookies. Bake the chilled cookies for 10 minutes then lift the side of the pan about 4 inches and let it drop down on the oven rack; repeat with the opposite side of the pan. You’ll see the edges of the cookies set and puffy centers collapse inward. Bake for another 2-3 minutes, until the centers puff up again and repeat. Repeat this process every few minutes until the cookies have baked for 16-18 minutes. The edges will be golden brown and the centers will be wrinkly, lighter in color, and not fully baked through – just the way you want them! Transfer the pan to a wire rack and let cool completely on the pan before removing. Repeat with the remaining sheets of cookie dough. Thanks, Kayle!! Oh yeah, I’m a sucker for big bakery cookies and these hit every single mark! OMG there were cookies like that in my high school cafeteria too! And we would eat them warm for BREAKFAST!!!!! Thanks for the flashback! I actually came to the site to look at your Levain copycat cookies….but these are maybe making me change my mind. Oh man! Breakfast!! I don’t know if they were available in ours for breakfast but that would have totally done me in! I saw on Instagram that you made the Levain recipe over the weekend (yours looked so great!!) 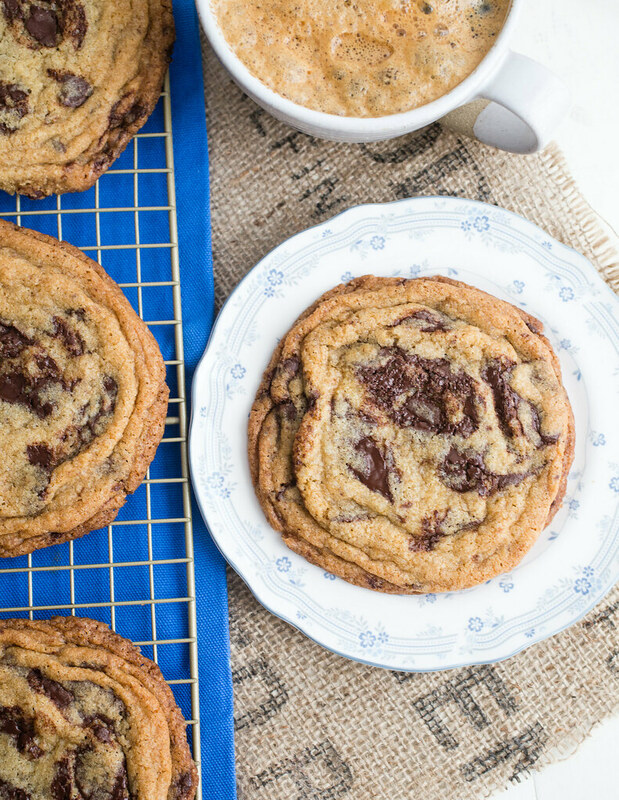 but I KNOW you’ll love this recipe too, especially if you love gooey cookie centers! Your site, every time I visit it makes me so happy. It looks great! As do these cookies, they look amazing. Thanks for sharing! Thank you, Heather! I’m really happy with how it turned out and I’m so glad it’s gone over well with readers too. You guys are the my “customers” after all! And if you try the cookies, I hope you love them!! Good to know about using all WWWF – I may just do that next time around. We loved the nutty, hearty flavor the WWWF gave and more of it may not be a bad thing. I’m so glad others see the resemblance of wrinkly puppies in these cookies too! I don’t feel AS crazy when others can corroborate. 🙂 And thank you, also, for your comment on the new site – it’s been a long time coming and I’m so happy my readers are enjoying it! THE BEST RECIPE BY FAR!!! They are delicious!! How long will they keep and stay chewy? Hi Amanda! They should stay chewy, when stored in a sealed container, for 3-4 days. How do you print your receipes? Hi Evelyn! At this time, there is no print function on the site but this is something that will be coming back shortly. If you need to print, you can copy the text and paste it into a Word document and print from here. I’m sorry for this temporary inconvenience!